As part of the Ride the Rockies stop in Edwards on Sunday, June 10, there will be live music, food trucks, beer and vendor expos from 2 to 9 p.m. at Freedom Park. The community is invited to help celebrate the Ride the Rockies, a 418-mile tour that also visits Breckenrdige, Steamboat Springs, Grand Lake and Winter Park. EDWARDS — The Ride The Rockies bicycle tour will be spending the night at the WECMRD Field House in Edwards on Sunday, June 10. The WECMRD Field House will serve as the first stop in the 418-mile tour that will visit Breckenridge, Steamboat Springs, Grand Lake and Winter Park. Riders will begin to roll into town around 2 p.m., right when the festivities kick off. New this year, the expo area is open to the public and will have live music from two local bands along with food trucks, beer and vendor expos. The community is invited to enjoy the views of Freedom Park and join in the fun from 2 to 9 p.m.
“When the Vail Valley Partnership and Ride the Rockies approached WECMRD as a potential host for the tour, we jumped at the chance to showcase our world-class Field House in Edwards and bring in a substantial amount of economic impact dollars to the community. Because of the size of our facility and expertise of our staff, we are one of the few organizations that can handle an event of this size,” said Janet Bartnik, executive director at WECMRD. Cyclists will “Ride the Loop” by beginning their epic ride in Breckenridge and returning to the historic mining town to cross the finish line to celebrate after completing 25,935 feet of total elevation gain. Each town in the 2018 tour offers hospitality and the charm of Colorado’s mountain culture. About 2,100 bike riders will be accompanied by at least 600 of their families and friends in Edwards. The overall economic impact for local businesses is estimated to be $200,000-$250,000 in a 24-hour period. The Inn at Riverwalk is completely booked while other lodges in Avon and Beaver Creek will accommodate other participants. Hoping to attract new customers, several of those businesses are receiving free advertising in the RTR mobile app by providing discounts for Ride the Rockies participants. 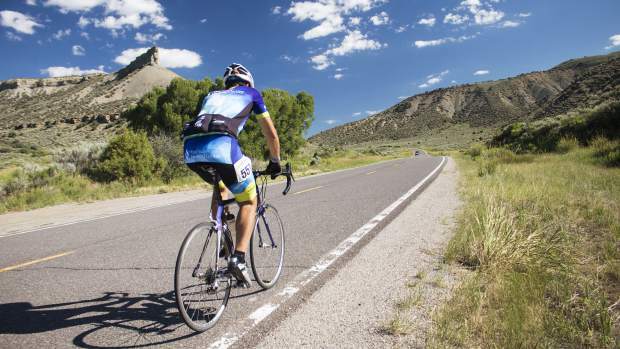 It has taken a full community effort to organize and plan for the popular Colorado bike tour. The local police, paramedics and Battle Mountain High School’s Booster Club have all been involved in the preparation. Shops and restaurants in The Riverwalk at Edwards and the surrounding area are going to see a significant wave of people visiting their business on June 10. As June 10 approaches, locals are asked to welcome the 2,700-plus RTR participants. The bike riders will be coming down U.S. Highway 24 from Leadville and into Minturn. As the riders enter onto U.S. Highway 6, they will continue west toward Edwards and turn right onto Miller Ranch Road — just before Riverwalk — where they will be welcomed for their first night of rest at the WECMRD Field House and Battle Mountain High School. The next morning from 6 to 9 a.m., bikers will re-enter Highway 6 from Miller Ranch Road and pass through Riverwalk to Wolcott and make their way toward Steamboat Springs for their next night of rest. Road safety is a priority for a bike tour of this size. Riders are expected to stay within their bike lanes and drivers need to share the road. You can report a bike rider’s number to Ride the Rockies staff if someone needs to be reminded to stay in their bike lane. State troopers and local law enforcement will be monitoring the tour in places with tight lanes and major intersections. To contact RTR staff, or to find out more information on the event, visit RideTheRockies.com.